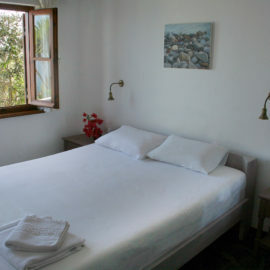 Alkyoni complex consists of 15 rooms, 5 family rooms and 10 singles or doubles.. The rooms are simple, clean and comfortable and half look out over the crystal clear waters of the Saronic Gulf towards Aegina and Moni Island. The rest look back up into the pine-covered hills. All rooms have been refurnished at 2017.